MAXIMUS MPXHD is a Full HD ex-proof PTZ which produces high definition images and is ideal for effective video surveillance and process control in harsh settings where the presence of gases or flammable dust can create a potentially explosive environment (a reality often found in the oil and gas industries or marine and industrial sectors) The Full HD, 1080p, 60fps camera incorporates an outstanding 30x optical zoom, able to accurately identify the smallest details in a scene, with the ability to transmit images via Ethernet, H.264/AVC and MJPEG compression and ONVIF Profile S compatibility to allow for use with third-party products. The response to the operator’s commands is instantaneous, for a fast and accurate detection of a target in all conditions. The care taken in the design, the choice of high quality components and the strong, AISI 316L stainless steel construction with IP66 protection guarantees perfect operation and durability in temperatures ranging from -40°C to +60°C. Thanks to the built-in wiper, images are always perfectly clear; also available is the WASEX washer kit with certified explosion-proof pump, which reduces the need for maintenance. 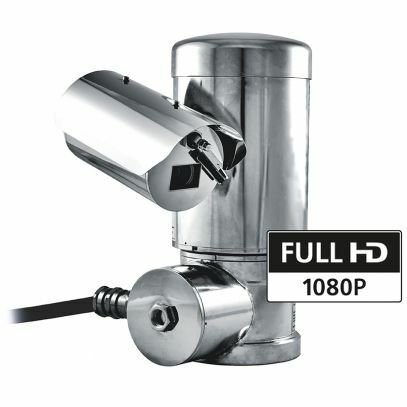 The ATEX/IECEx/EAC Ex/INMETRO certified versions are available as pre-wired options, with armoured cable and barrier cable gland, simplifying installation and making these PTZ cameras the perfect solution for use in the most demanding video surveillance installations, and in the most extreme conditions.